We are a household of two different religions and cultures. Both our worlds were so far apart as we grew up that we were separated by a wall - literally. My husband was born and raised as a Catholic in the “GDR” or what is known as East Germany. A child of the 70s and 80s, at a young age he saw the wall come down in his early twenties. I am a Sikh, born in Bombay and raised around the world from the US to the Middle East. Fate definitely played a big role in bringing us together. After 16 years together we have become a pretty good team. There are times however, when our upbringing becomes very apparent, often with regards to our son. My husband, due to the circumstances he was raised in, is conservative and at times even narrow-minded on certain topics. As an Indian I was raised to respect our traditions and cultures but very openly and freely. At times I am probably too liberal in my thinking. Funnily though, when it comes to establishing rules I am the stricter of the two. My husband likes coming home and being at home: garden work, DIY jobs around the home – all are his ideal ideas of spending free time. I love getting out, taking spontaneous trips, going out with friends or inviting them over, the theatre or concerts. He wants to buy a house; I think we have time for that when we are 60. He enjoys German stand-up comedy on TV, I rather watch Game of Thrones. We usually find common grounds on most subjects and our 11-year old son grows up with a colorful and diverse lifestyle and will often have two very different perspectives. He uses this to his advantage as his teachers have often told us that he tackles issues and problems at school from several sides and proposes ideas that are out of the box. From my husband’s perspective, who was taught to live within walls, without having the freedom of expressing thoughts or ideas, he is proud that his son has this privilege. Interestingly enough when it comes to traditions my husband is fairly liberal, whereas I on the other hand find that traditions make a strong foundation for a family. So, I pay attention to give our son a balance of both his cultures and values from both our religions. Holidays like Easter are always a good time to discuss and research customs and traditions and a great place to do this is in the kitchen while baking or cooking. Easter is one of the most popular religious holidays in Germany. Christians celebrate the resurrection of Jesus Christ. Some, modern-day Easter traditions however, still contain traces of even older pagan rituals. Dying eggs, for instance, goes back to a pre-Christian symbol of fertility. One popular tradition here in Germany is Easter egg hunting. On Easter Sunday families will spend the morning in the garden or around the house hunting for hidden colored eggs, nests with chocolate, baked goods and gifts. My favorite tradition, I have to say. I tend to integrate other customs I picked up from the countries I grew up in and spread them further amongst my German friends and family members. 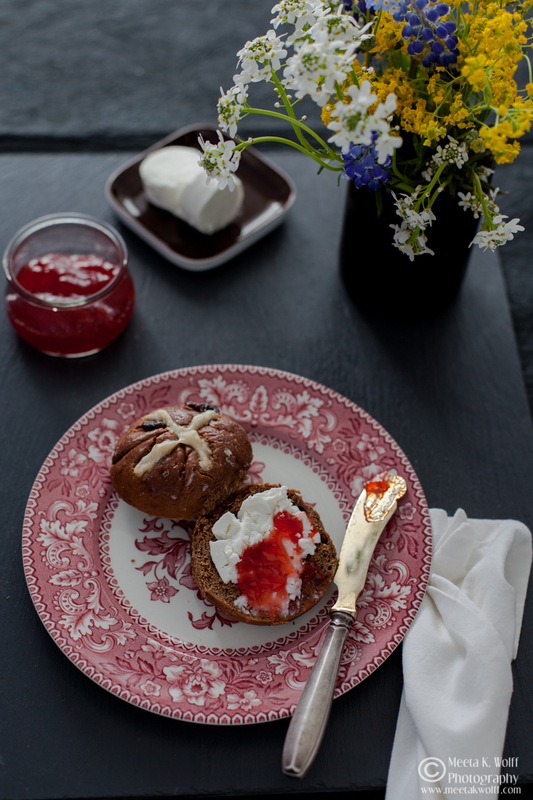 I love baking mini challahs and hot cross buns, putting them in baskets with pretty colored eggs and flowers and leaving them for my friends on their doorsteps or hiding the baskets in bushes for my family to hunt. As the ears of chocolate rabbits are then bitten off I enjoy sitting back and listening to my husband’s grandmother tell us stories of Easter festivities when she was growing up. Hot cross buns have become a tradition here, I’ve been baking them almost every year for the past 10-12 years. 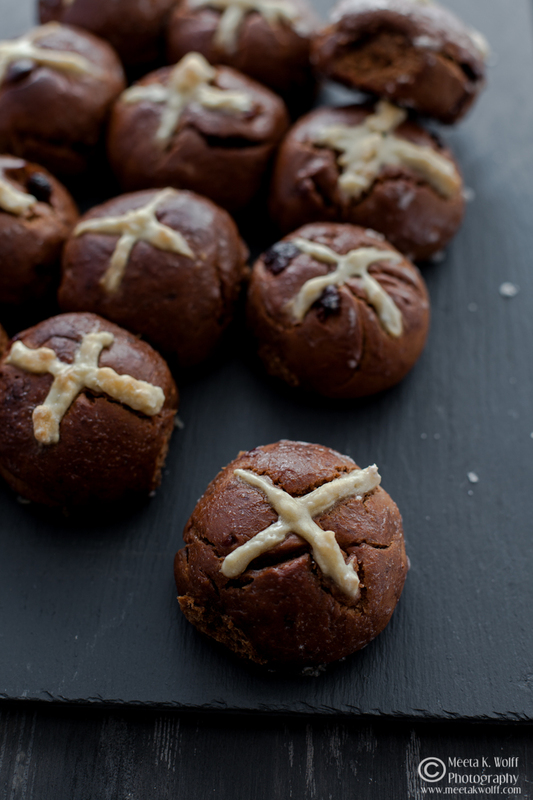 Often I bake the traditional hot cross buns but there are times when I am in the mood to play around and try out different ideas. 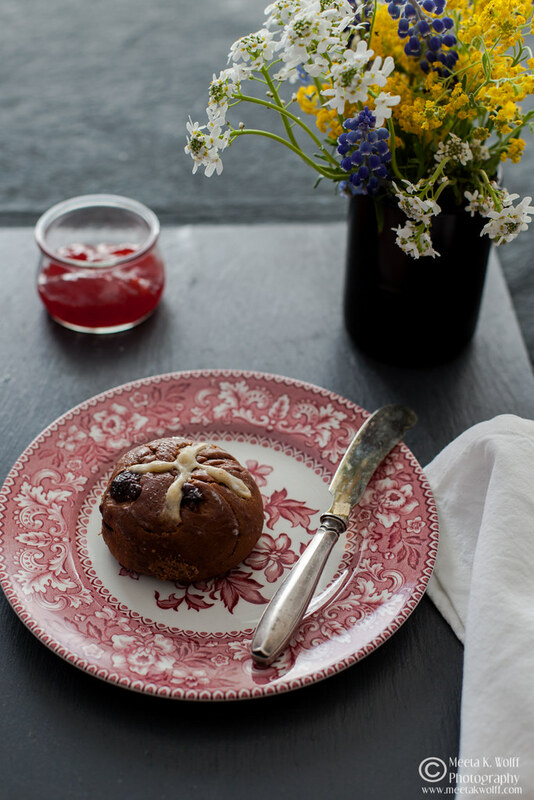 This year I deviated from the classic recipe and created luscious and sinful buns packed with dark chocolate chunks, moist prunes and sweet cherries. All I can say religious or not – get into the kitchen and start kneading. Enjoy! The buns are great straight out of the oven, slightly cooled and with generous lashings of butter. I almost prefer them the next morning slightly toasted spread with goat cheese and dollops of strawberry preserve. Soeren and I are off to Berlin for the long Easter weekend. As Tom is working on a project in Berlin currently and has an apartment in the trendy Friedrichhain area – it is absolutely perfect for a nice weekend just the three of us. 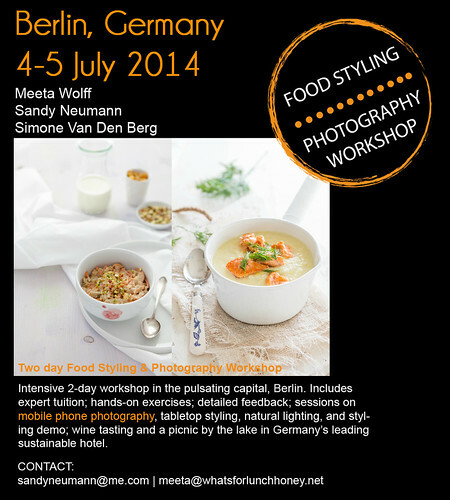 We’ve got a lot planned – I love Berlin! So much to see and so much to discover. I hope you all have a great Easter break. Celebrate, feast, relax and re-calibrate – don’t forget create memories and make traditions – these are important for us. I love this post, Meeta. Those differences make relations all the more interesting. It's one of the things I loved so much about P2P: all these different people with different backgrounds and one shared passion. Thank you so much Denise. Differences, if channelled positively make a very textured and interesting life in a relationship. I am quite intrigued to see how Soeren handles and translates it to suit him best. Hope you had a lovely Easter too! Enjoy Berlin, my dear! You should visit the "Do you read me" - store in Auguststraße - so many great magazines in english and german! I like the look of your hot cross buns, they must taste devine as well. also great that they freeze so well so you can make them in advance! 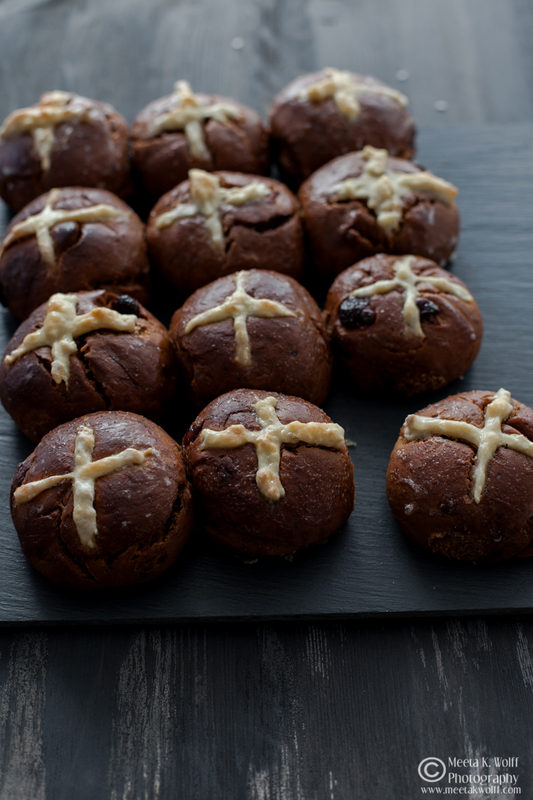 Yes I did freeze some (without the crosses) for a breakfast later on :o) Would love to have you over for a few! A lovely post! It's good to see that two people hailing from two totally different worlds can get on well together and love each other.... Bless you! Thank you so much Rosa for the blessing. It feels special! I like them as they can be made for any breakfast and like Regula said are great to freeze. A lovely post! with a lovely recipe! The Pictures of the flowers are too beautiful! Wishing you Happy Easter as well! Thank you so much! 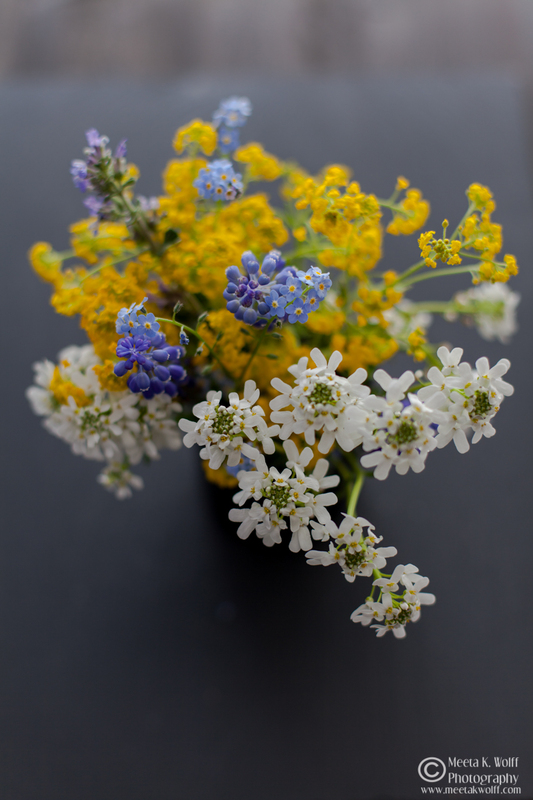 The flowers were a great find on the fields where I usually walk / jog! 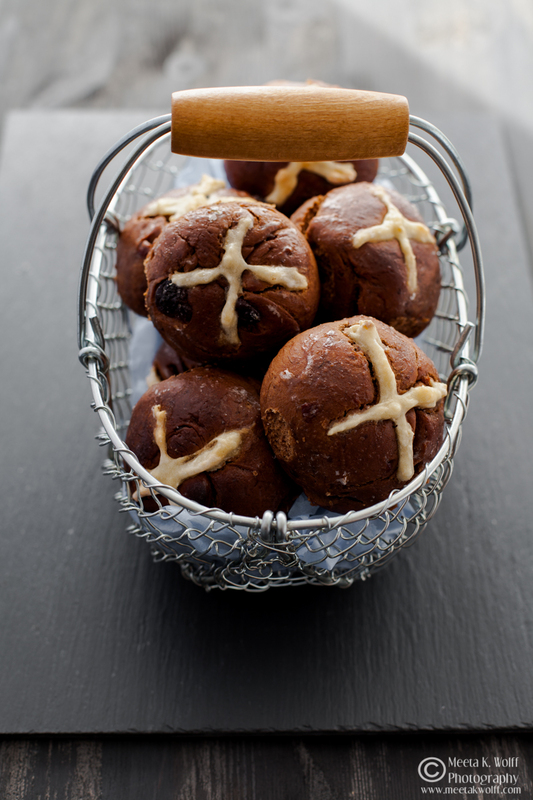 The buns look delicious - I make a chocolate non-dried fruit version for my teens. 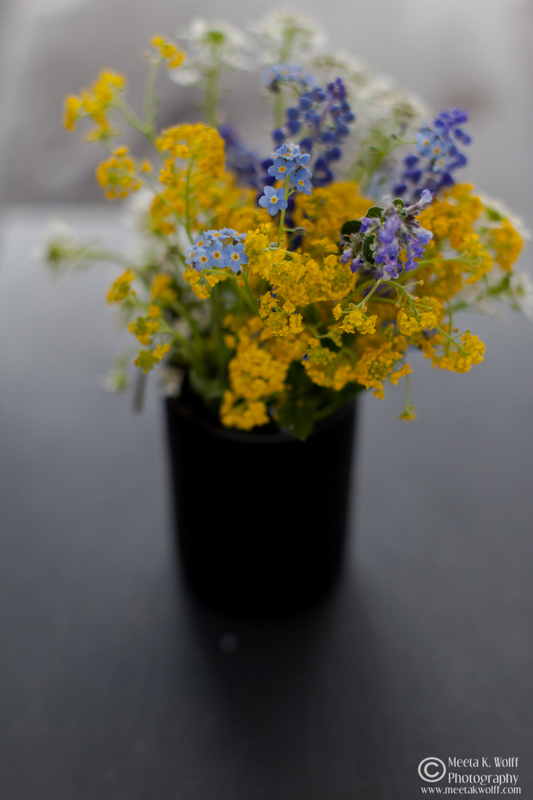 But the thing I like most are those flowers - spring has arrived. Good to know more about your family backgrounds....very interesting how different celebrations are enjoyed. I always love your stories Meeta and I can only imagine host must be combining two different cultures in one house. Knowing you both I can also clearly see the differences in terms of temperament which I think is a perfect match..
As for these hot cross buns... They look so perfect! 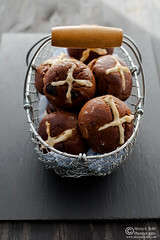 I wish I had time to make sweet hot cross buns too but I'm off to Lugano for a few days now, so no baking! Have fun in Berlin! Happy Easter! Oh yes we do have that temperament LOL! I am always interested in what people say about us after they have met us. So it was cherished to get your thoughts ;o) Hope you enjoyed Lugano. The images looked brilliant. Meeta what a lovely post about cultural differences and how it can work out so well. I think that´s why I also feel so "at home" here, my husband respects my culture, shows interest to it... And besides that living in such a multicultural city as Frankfurt it also helps a lot. Oh Frankfurt must cater to many cultural differences. I am glad to hear you feel good in Germany. I do to it's become my home and I cannot imagine leaving it. What a beautiful post, I think your son is very lucky to get exposure from two different cultures. Men tend to be a bit conservative, when it comes to raising there kids, at least my experience...the images are amazing and the buns look so artfully crafted. Thanks Simi. Tom is open minded on many subjects but as you said when it comes to raising his son he falls back on his conservative ways. But I think it is good that Soeren is growing up learning to use both cultures and ideas. A lovely post! with a lovely recipe! The Pictures of the flowers are too beautiful!